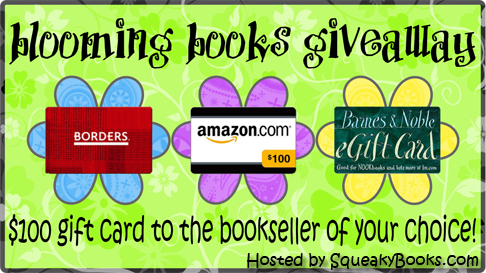 Squeaky Books: Blooming Books Giveaway! Nominees Announced! It's time to announce the nominees for the Blooming Books giveaway! I'll be updating this list as I get the results from the other blogs, so keep checking back! And I went WAY over my 1,000 followers goal (I'm seriously in shock. I keep looking at it going "well that can't be right") and so the winner of a $25 GC is... Lisa Richards! Congrats! Thank you to everyone who entered. Check back HERE on Monday to see who the winners are! Congrats to the people who have gotten nominations so far! Can't wait to see the rest of the results! Wow, how awesome to see my name on this list. Thank you so much for nominating me! Its really an honor. Congrats to the other nominees and good luck to you all. And thanks for the support I see in comments on here. You all rock and I'll be here to support you when your nominated. WooHoo! I love Gift Certificates.